Question about downloading. According to the FAQ, it will only function on the device you first download it to. So that would be my Galaxy S7 smartphone. It also says that once I own it, it's mine, and I never have to pay for it again. But if I get a new phone in a year or two, I'll have to download it again, to the new phone, won't I? Won't I have to pay for it again? Or am I missing something in the translation? I wouldn't be using the GPS while I'm driving but it seems like a pretty handy way to map things out beforehand, and check on a whole lot of other things as well. Your app has a lot of functionality that I might be interested in (plus hubby could drive while I have the GPS on, when we're driving together. HE GPS's. I don't). Hi and Thank you for contacting us. There are a couple of factors about transferring the App. If you are using or buying the same type of phone…iPhone to iPhone or Android to Android… It will transfer. If not, they will not transfer because they are two totally different operating systems. For your situation, if you buy a new Android phone, the app will be in your Play Store and will be able to be downloaded along with all of your other apps. If you buy an iPhone, it obviously won't be able to be transferred. We also want to thank all the support to all those who have been with us over the past 5 years now!! With no additional money to you of course, we are so excited and happy to announce that the new Rebuilt and Redesign has all new code from our new developers! We talked to hundreds of our users, listened to all the feedback, implemented it and so much more!! Please write down or take a screenshot of all of your Favorites. The one thing that couldn't be done was saving your past marked favorites since the app was rebuilt. We don't ever anticipate this again and you can easily check again your favorites in the new updated app. We are sorry for this inconvenience. We added a very small Ad at the very bottom of the app. It cost us a small fortune to rebuild the app from scratch. The mapping license is an additional cost that we didn't have before as well. Please know we didn't raise the price of the app as we hope the ad covers this additional cost. FYI - During Navigation you will not see the ad as it's only on the menu. * You can zoom in and out without screen problems. * "Take a Tour Section" in the “More" section shows you what every function does for each part of the app. 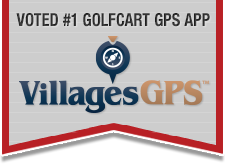 * Version of the App is in the "More Section"
* We have a new Facebook Page Villages GPS - Home | Facebook Please “Like” our page. We will be adding some “Did you know’s” on there. Hopefully you will like everything we have done and tell all of your friends and family. If you don’t like it… Don’t tell them (LOL)! If for some reason it didn’t automatically update. follow these steps to manually update it. 1. Open the Google Play Store app. 4. Apps with available updates are labeled "Update." 5. Select "Villages GPS" and touch Update. 2. Click the Update button on the bottom right. Love this AP but sometimes the voice does not come on but everything else works fine. Well worth the price IMO. Really? Personally I have great difficulty reading a “paper map” when I am driving and for safety sake,this should not even be suggested. Ridiculous. I can glance at my phone and easily see where I am headed. . I hope you were just joking. The AP is simple to use and great!! I downloaded the app yesterday. It came off my rewards credit. I take surveys (2-4 question surveys like "did you go to that store yesterday? Yes? Great. Scan the third item on the receipt. Great. Congrats, you just earned 50 cents in google play credit). So I have around $50 in google play credit. I like spending it wisely, which is WHY I have so much of it. Usually I use it on books and movies. I use written directions more than anything else, which I get by using "street view" to map out a trip. That way I can see the entire trip as if I was actually driving it. And I can write down landmarks that I can watch for, to know when I've gone too far, or when I need to turn, or if it's just a few blocks past that, etc. The only time I EVER get lost is when I'm in Florida. For some reason, my brain keeps thinking north is south and east is west there. Combine that with driving a golf cart on a rainy night in a place you've never been to before, and you end up with me - driving on the main road, because I missed the golf cart turnoff, and then having to "hop the curb" on the bridge to get my cart back on it. I think the GPS will be useful for me to find directions and see exactly where the tunnels are, and in which direction I need to turn, and what I will see when I get to a spot I need to pay attention to. And then - I'll type it all out and print out the directions. Just like an AAA triptik. The iPhone has 2 different volume settings and a Mute button on the top left. Make sure your Mute button on the left side of your phone is off. Turn up your Volume as high as possible before opening the app. Start a route from your home or wherever you are. After you click “Start” and it shows the route, now turn up your volume again. Hi again GPS people! I'm not able to get the point to point feature to work. Bear in mind I am not IN the Villages, or even in Florida, at the moment. I figured I'd do a test to see this feature by plugging in our "soon to be new address" and get directions to Spanish Springs town square. But when it provides me the search buffer and I enter the address, it confirms that it recognizes it - and then promptly closes with an error asking if I'd like to either close the app or provide feedback. I never get a chance to input the address I want to end up in. I really don't need directions from my house in Connecticut to Spanish Springs in The Villages, though once I get closer to Florida when we DO drive there in a month or so, being able to get directions from a rest stop outside Florida might be helpful. Is the Point to Point feature disabled, or unable to check distances far from my current location? If not, please let me know what I'm doing wrong so I can get it to work for me. Thanks! Point to point is only meant to get directions from two different places that you’re NOT currently at. When you click to start it gives you the option to see the time and distance it takes to get from those two places by golf cart or automobile. Click Start to switch between the two. If you want regular Directions… Find the place you want to go to and once you find it, click directions by Automobile or Golf Cart. If you have any more issues or questions, please contact us at the email address below for faster replies. e-mail sent. I think you misunderstood or misread my first paragraph in that post.